Don't you just love white and navy together? First of all, I cut my card about 1/2 inch larger than the size of the Snowflake Embossing folder which I just received. I added the navy ribbon before gluing it down to the card so the ribbon doesn't show on the inside. I cut out my scallop and then cut out the straight rectangle, both from my Spellbinder collection of Rectangles. Sometimes the stamped image is much easier to add after the mats are cut and other times it is easier to cut after it is stamped. It just depends on what I am doing. 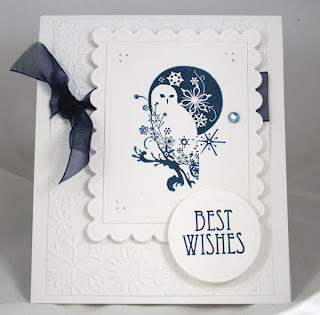 I love this elegant owl from the Inkadinkadoo Flourishing Bird Set and I thought the clean, crisp feeling of this card was determined by him. I popped it up using dimensionals and added a slightly blue bling to make sure he got all the attention he needed. I stamped Best Wishes from the Special Occasion Stamp set by JustRite Stamps. Then I determined the best size of circle I needed to add a tag at the bottom of the card. This also carried the navy to the bottom of the card, which I felt it needed. This is GORGEOUS!!! Mind if I case this one!!! I have this set and don't use it nearly enough ... thanks for the inspiration! Oh my, Joan! How elegant is this! Love the crisp simplicity! I love this Joan.. Navy Blue and white - how much prettier can you get??? Joan, your card is Absolutely GORGEOUS!! This is going to be a must have stamp set! I love the Navy Blue and White together it is so crisp and elegant. Love the little touch of bling too! I Love you style!! I do love navy and white :)! Your card is just gorgeous! A very beautiful card Joan! The stamp is perfect for the design and I love your colors . . . so pretty!